On this day, Col. John F. DeCourcey, commanding the 26th brigade now camped on and around a hill above Tazewell, Tennessee, intended to send troops south toward Big Springs and Little Sycamore and then west to Big Sycamore, hoping to fill more wagons with forage to support Gen. Morgan's garrison at Cumberland Gap, 15 miles to the north. About seven o'clock in the morning, the 16th Ohio, commanded by Major Philip Kershner, came up to the advance pickets, south of Tazewell, to relieve the 14th Kentucky which had manned those positions since the day before. In a gap between two hills were positioned two artillery pieces, this being a strategic point from which the road to Tazewell could be guarded. Companies B and E, commanded by Captains Joseph Edgar and Richard Tanneyhill, respectively, were assigned to guard and support the artillery pieces. Shortly after the 16th took up these positions, enemy cannon was heard in the distance toward Big Spring. This turned out to be either a signal or purposeful distraction as this was immediately followed by the cheers, yelling and heavy volleys of musketry coming from attacking Rebel troops. The Rebels had been secretly moving up and hiding in the woods on the hills around the gap during the night and now came pouring down those hills toward the artillery post and soon surrounded it along with companies B and E of the 16th Ohio. The Union cannon were able to twice discharge canister leaving wide gaps in the Rebel lines. The great volume of Confederate troops, however, enabled them to rapidly close the gaps and continue to approach the little artillery emplacement. When the rebels were within 20 to 30 paces of the Union guns, they were quickly limbered and sent to the rear, even as the Rebel attackers were within a few yards of the road by which the guns were retreating. According to Capt. J. Davidson of the 14th Kentucky, which had taken up a resting position a little north of the 16th's picket lines, the two artillery pieces which escaped the Rebel attack took up a position in the orchard where the 14th Kentucky had now formed a line of battle, and again opened fire on the enemy. The 14th Kentucky also provided rifle fire, both attempting to assist the two surrounded 16th Ohio companies. During the chaos of the attack the Rebels on the hills above fired a massive volley into the 16th's position. It is reported that a volley at such short range should have virtually annihilated the two companies, however, being on higher ground, the Rebels fired mostly over their heads. The sad exception is that Captain Joseph Edgar of Company B was shot in the head, killing him instantly. Of all the miniballs and hand-to-hand combat and cannon fire, only Captain Edgar suffered loss of life. Just behind (north) the surrounded position was Major Kershner with 16th Ohio companies C and G, held in reserve. Kershner's companies were able to provide some assistance to the surrounded troops as they fought their way off the hill. During this action Major Kershner's horse was shot out from under him. At this point the combat actually became hand-to-hand. The overwhelming Rebel forces continued to maintain their lines of battle and came down the hill, yelling and shooting, confident of their impending success. Aware that other Rebel troops were attempting to flank their advance positions and having exhausted nearly all their ammunition, Kershner and the remaining Union forces withdrew north, through the town of Tazewell and towards the main camp on a high hill in the rear of that town. 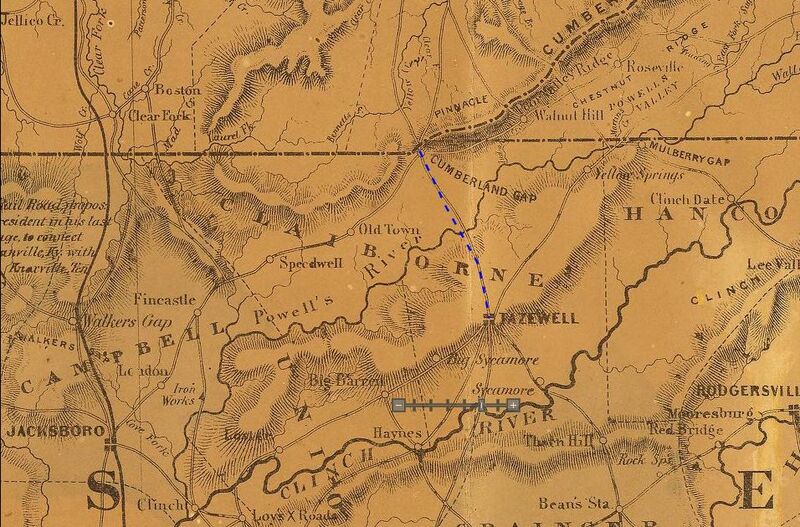 The Rebels had swept away the two 16th Ohio companies, the remnants of which were scattered all about the hills and valleys south of Tazewell, and were now pushing the Union force back toward and through Tazewell. It is reported that at least two full Confederate regiments were pushing through Tazewell and toward the main Union camp and that four additional enemy regiments were held in reserve. As the retreating Union troops arrived back at the main camp, the forces there had positioned their four cannon along with the two that escaped the onslaught, and opened fire on the advancing Rebels. The enemy, seeing the firepower along with the additional Union troops on the hill, fell back and positioned themselves on the hill formerly occupied by the 16th Ohio's advance units. The attack had ceased, for now. DeCourcy's artillery continued to fire on the Rebel positions. At one point the Rebels set up two of their own cannon and returned fire but the Union artillery soon dismounted these and killed about half of their artillery men. Throughout the afternoon the remnants of companies B and E, those who weren't captured, came straggling in. They had made it through the Rebel lines, some hiding in bushes or crops, taking various, circuitous routes around the many Rebel troops all around Tazewell. Two soldiers of the 16th Ohio who were among those desperately trying to return to their lines, Corporal Paul Wilder and Private John McCluggage, both from Captain Edgar's Company B, inadvertently headed toward the Rebel lines. As one report tells, while attempting to hide in some bushes, they were hailed by Lieutenant-Colonel Gordon of the 11th Tennessee, demanding to know their regiment. The quick thinking Union boys responded by aiming their French rifles at Gordon and demanding the Colonel's surrender. The story goes on to say, since they were within speaking distance of the Rebel troops, Cpl. Wilder took Colonel Gordon's horse and lead it away while Pvt. McCluggage walked behind the two, his gun cocked with the Colonel knowing if he gave them away he would surely be shot. The two lucky soldiers brought Lt. Colonel Gordon all the way back to the Union camp at Tazewell where he was turned over to Colonel DeCourcy who ordered Gordon's horse to be cared for. It is said that Colonel Gordon sat down on the ground, watching the Union cannons fire at the Rebel positions, heaved a heavy sigh and said, "Well, this beats hell." Following up on the two "lucky" soldiers from Company B, Wilder and McCluggage, Corporal Wilder was immediately promoted to Sergeant on that very day. Sadly, exactly six months later, to the day, Sergeant Wilder, having been wounded at the Battle of Chickasaw Bayou, died of those wounds (February 6, 1863) in a hospital at Paducah, Kentucky. Similarly, Private McCluggage, also wounded at Chickasaw Bayou, died of his wounds (January 13, 1863) on board a hospital steamer on the Mississippi River. DeCourcy's brigade kept up the artillery barrage against the Rebels, keeping them at bay. He later learned they were actually up against a full Confederate division, numbering no less than seventeen thousand men. Knowing he must retreat back to the safety of Cumberland Gap, he was doubtful doing so in the daylight would be successful. DeCourcy performed a number of maneuvers, spreading out his brigade in single rank and counter-marching companies over exposed points to give the appearance of an army corps taking positions for battle. This tactic was successful as Confederate General Stephenson watched it from afar and actually prepared for a counter attack by DeCourcy. As evening came and with it the concealing darkness, DeCourcy started his retreat on the road back to Cumberland Gap. About two miles toward the Gap, he met General Morgan and the reinforcements he was bringing to DeCourcy's aid. The need for such reinforcements removed, the entire force returned to Cumberland Gap, arriving there at three o'clock in the morning. Through all the heavy action, only Captain Edgar was known to be killed with 15 wounded and 52 taken prisoner from the 16th Ohio. It was reported that 100 Rebel soldiers were killed and as many as 400 wounded. DeCourcy had managed to save his greatly outnumbered force, all six of his artillery pieces, fill with forage and save every one of the 200 wagons, and bring all but just a few soldiers back safely to Cumberland Gap. Given the size and desire of the large Confederate force against him, this accomplishment was a great one. A few days later the 16th Ohio's surgeon, Dr. Basil Brashear, travelled to the Confederate lines near Tazewell and, under a flag of truce, obtained the body of Capt. Edgar, bringing it back to the Gap for burial. Nevertheless, General Morgan now knew a large enemy force, at least double the size of his own, was looming just a few miles away. His supply lines had all been cut and now the desperate foraging missions were becoming dangerous or even impossible.